As a copywriter, I like working with words. But as a crafty copywriter, I know that numbers have power. Some prices are attractive and some statistics are compelling. So if you’re not thinking carefully about how you present the numbers in your sales copy, you’re missing out on a chance for some subtle and effortless persuasion. Here are a few quick tricks to help you control your audience’s perceptions about the numbers you show them. You’ve never seen a house for rent advertised at £9,000 a year. You won’t find a car with a 60-month warranty, and you’ll never buy a pair of jeans with a two-fortnight return policy. That’s because the value we attach to a number depends on its context. Breaking down the same total in different ways can lead to different perceptions about how much something really costs. If you were to tell me that I’ve been spending more than £1,000 a year at Starbucks, I’d be horrified. But if you told me I spend £3 a day on mochas? I wouldn’t react at all. In reality, it’s the same amount of money. And this shift in context — and perceived value — is something you can put to good use in your sales copy. Don’t sell a fridge with a one-year warranty. Sell a fridge with a 12-month warranty. It looks and sounds bigger, and it “beats” a greater number of potential alternatives (like 9 months or 6 months). And if you’re pitching a software subscription at £90 a month, try to change their perspective. Let them know that it works out to less than £3 a day, and make sure you mention that it’s cheaper than a daily cup of coffee. With a little careful partitioning, prices don’t have to seem painful at all. Without lowering your prices or doing anything misleading, you’ve turned an intimidating cost into a reasonable investment. And that means you’ve probably just made a sale. If you ever had a book of optical illusions as a kid, you’ll know that our brains are fully fallible when we take a first look. It’s no different with numbers. You might think a £1200 laptop is a bit pricey. But a £1,200 laptop seems even worse — and all we’ve done is add a comma to the same number. Things get more out of proportion when you start counting the pennies. A £1200.00 laptop looks excessive, and a £1,200.00 one makes the eyes water. How do these psychological tricks occur? There are a few explanations. When you add in the decimal point and the pennies, the number takes up a bigger physical space. At first glance, £1200.00 looks almost as big as £12,000. Even after the reader has corrected themselves by noticing the decimal point, that first impression sticks in the mind. On top of that, those extra decimal places are filled by zeros. And we all know that numbers with lots of zeros are massive numbers. With the comma, things get more complicated. Every time we read, there’s a silent voice in our head that “sounds out” the text. Most of us probably read £1200 as “twelve hundred pounds”. It’s short, it’s snappy, and it sounds a bit like we’re buying twelve winter coats. Not so scary. But with £1,200, we start to read it as “one thousand, two hundred pounds”. It takes a long time to sound out this number in our head, and the full weight of its value gets recognised. This time, it sounds a bit like we’re making a mortgage payment — and the alarm bells start ringing. Add pennies and commas when you’re presenting a benefit to the customer: a saving, a reward or a free gift. 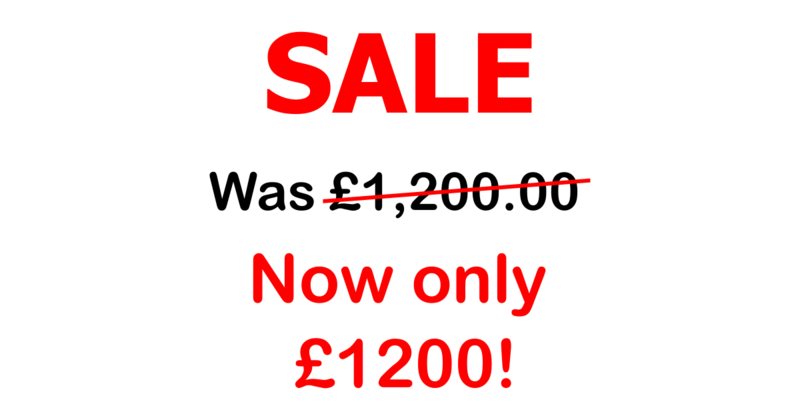 Save up to £2,000.00 on the listed price of your new car, and get £150.00 cashback! Leave the pennies and commas out when you’re talking about costs to the customer: product prices, admin fees or insurance. Get this laptop for only £1200 with optional insurance at just £9 a month. Humans love statistics. Even if they don’t always process them properly. We’re used to dealing with real numbers: real objects in real groups in the real world. Our brains need to do extra work to turn a percentage into a real-world concept. And this additional mental fatigue can end up skewing our judgement. If your doctor recommended a serious operation that had a 10% mortality rate, you might feel anxious about going under the knife. But if that same doctor told you that 1 out of 10 patients dies during the operation, you’d go home and start getting your affairs in order. Or how about the fictional statistic claiming that 63,149 smokers out of every 10 million die before the age of 40? It sounds horrific. On the other hand, 0.6% of smokers dying before 40 doesn’t sound that tragic at all. In both of these examples, the real-world numbers and the percentages are equivalent. The difference is that when we’re dealing with percentages, we don’t feel like we’re dealing with real people in real situations. Percentages feel like a broad representation of the largest possible groups. A probability or a likelihood based on millions of other people. With real numbers, your readers automatically start to identify with the people being represented. They can imagine a real group of individuals (like ten patients) and a portion of that group (one dead patient). And since we’re all such relentlessly self-centred creatures by nature, your readers place themselves into the situation: they imagine that they’re the one out of the ten that will die. Things are getting morbid. So let’s see how you can use this effect to your advantage. Use real numbers for the good stuff — when you want your audience to identify with the statistic. If you tell them that 8 out of 10 customers are happy with your product, they’ll think “I could be one of those 8 happy people”. Use percentages for the nasty stuff — when you want your readers to feel like the statistic doesn’t relate to them. You’re better off saying that “3% of users experience undesirable side effects” rather than “3 out of 100 users experience undesirable side effects”. We all know how the basic rounding tricks work when it comes to pricing. A burger selling for £9.99 is so close to £10 that it hardly matters. But our brains don’t see it as a £10 burger. Instead, we process the price as “£9 and some pennies” — which seems like a difference of almost 10%. A study at MIT tested three different prices for the same item of women’s clothing: $34, $39 and $44. As you’d expect, they sold more of the same item at $39 than they did at $44. But what you might not expect is that the $39 item also outsold the one at $34. Is there something magical about the number 9? Maybe. Or it could be a case of wary shoppers second-guessing the seller. When we see a product offered at $39, we know that the price has been manipulated. Instead of valuing the product at exactly $39, our brains really process it as “just under $40” — a small saving. But when we see a product at $34, our brains might be doing something different. Instead of seeing the price as “quite a bit under $40”, we instead process it as “quite a bit over $30”. We don’t see it as a reduction from a round number (40 – 1). We see it as a round number with a cheeky mark-up (30 + 4). And on a psychological level, it’s not attractive. For the most part, shave your prices so they sit just below a round number. 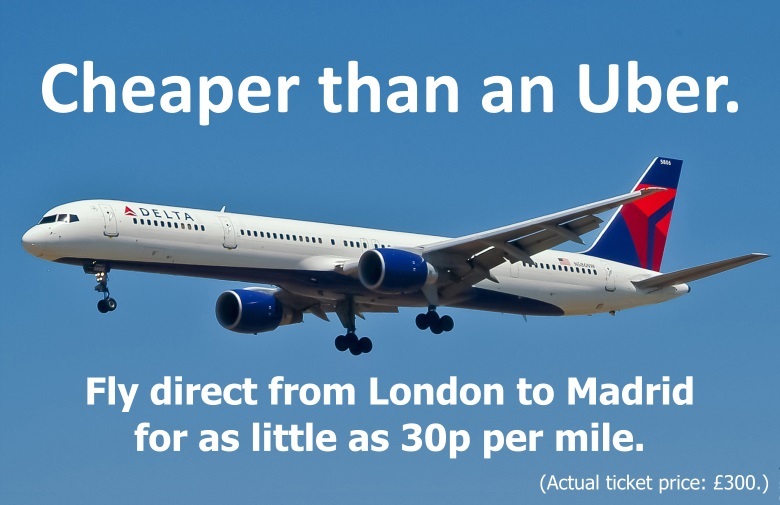 Fly direct to Athens for just £99. Against your gut feeling, experiment with raising prices between round numbers up to a 9 (but use caution, and track the results). If you have low moral standards, use taxes like VAT to give the appearance of a price that’s below a round number — or use a range of prices to the same effect. Get a first-class flight to New York for only £950 (£1140 with VAT). Rent one of our gorgeous holiday villas from just £95 – £160 a week. There’s a reason why so many restaurants, bars and coffee shops remove the currency symbols from their menus. In some cases, they just want to appear fancy and high-end. After all, the discussion of pounds and pennies is a vulgar endeavour, fit for the serfs and plebs. But for the most part, it’s because it has a beneficial psychological effect on the consumer. By removing the currency symbol from their prices, restaurant owners create a psychological separation between the number on the page and the number in their customers’ bank balances. A prime cut of steak for £45 is exactly that: a product and a cost. But a prime cut of steak for 45 is more abstract. It feels more like you’re reading a spreadsheet than a price list — just raw data without any real-world attachments. It’s no different when it comes to smaller numbers. When a coffee shop offers a latte for £4.90, you automatically fit that figure in with all the other numbers in your life. You realise that you’re spending about as much on a cup of coffee as you would on your daily commute, a supermarket steak or a month of Netflix. But when they offer that same coffee for 4.9, you don’t make the same instant association. Without a currency symbol or a second decimal place, you might as well be reading a review score or a pressure gauge. With that separation in place, your customers worry less about the pain of spending — and that means they end up spending more. If you’re in an industry that can do it without raising eyebrows, don’t include a currency symbol or the second decimal place. Use numerals to stress the value of a benefit, and use words to disconnect your customers from the numerical reality of small costs. Sign up today to get access to 1000s of movies online. Two cinema tickets for less than a tenner? Bargain. Just don’t try to use words to disconnect your readers from the bigger costs. No restaurant owner should give the price of a bottle of champagne its full weight by listing it as “One hundred and eighty pounds”. You’ve got the knowledge. So start putting it to use. These might seem like minor tweaks in theory. But to the average consumer, first impressions can be critical — especially when it comes to money. Stick to real numbers when you want people to identify with a statistic. And when you’ve got something nasty to get across, use percentages to make your statistics less relatable. Wherever you can, don’t let your audience connect your numbers with real-world money. Remove currency symbols, use just one decimal place — and experiment with avoiding numerals altogether.